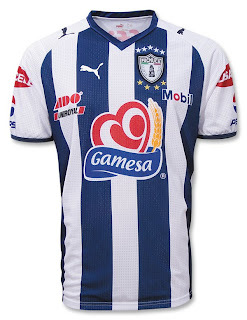 That’s what you get the most of when you put on the new Pachuca home shirt from Puma. Having never worn a Puma soccer jersey, I didn’t know what to expect. But I’m pleasantly surprised. You can see why the Tuzos (gophers) have risen to the Mexican elite in the past few years, wearing top-notch gear like this. I believe they’re the only top flight squad to be sponsored by Puma, which has the rubberiest logo anywhere—on the right side of the chest and over both shoulders. This jersey is well perforated for maximum venting, which is good when you’re running around a Mexican soccer pitch, or ‘cancha’. The only place that’s not mesh is the center back, where presumably the number/name would go (and we will soon offer basic customization options for this jersey). That’s not all. The shirt has a lining underneath, made of, yes, mesh, to give you an extra layer of sweat control, and a little added thickness and durability. A small FMF patch is on the right sleeve. Some information from the tags. If you don’t believe me that this is all from the tags, buy the shirt and see for yourself. PUMA has been in the Helps-You-Look-Good business since 1948. So, you’re interested in PUMA? Nice move. You’re obviously smart, confident and know what you want in life. Sure, you work hard, but you’re no slave to the rat race. You know the score. You call the shots. You make the most of your chances. So buy this, it suits you. There’s more but it’s too small. I would’ve liked some details on USP, the small sublimated tag on the lower back.